I followed Oliver Stern from Toronto Temperance to his new spot across from the Dupont subway stop and am glad I did. Though I’m not much of a patio person, that of Bar Begonia is well worth blowing a summer night on. The cocktails my partner and I enjoyed were among the best I’ve sampled in Toronto in a long time. Original, perfectly balanced, innovative but not experimental for the sake of being so; you won’t go wrong. The highlights were without question Yonge Money and the Salted Pineapple Caipirinha. I don’t normally order vodka-based cocktails but was absolutely floored by the grapefruit, rosemary and violette flavours of Yonge Money. Oliver is a nice guy and was a reason to head to the TTS above Sidecar on College. The same can now be said of Bar Begonia, despite it’s slightly out-of-the-way location. Also, the tapas on offer are of the high quality you would expect from the Fat Pasha group. Far better than typical cocktail bar fare. 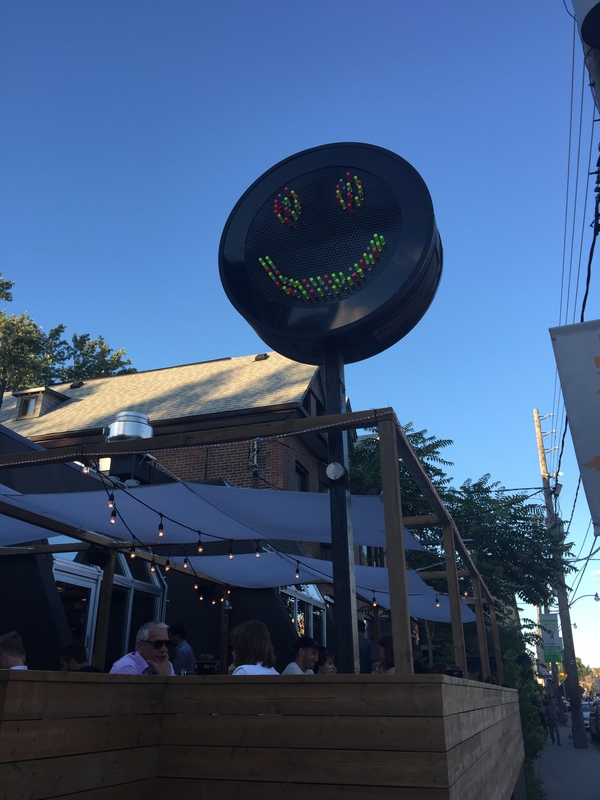 Look for the giant Litebrite happy face along Dupont. It’s pretty hard to miss.